Is the new movie "Blackfish" – a powerful damning indictment of SeaWorld – this year's answer to the 2009 Oscar-winning "The Cove"? [Dolphin Hunt Film "The Cove" Wins Documentary Oscar] After its first screening at Sundance last weekend, Magnolia Films and CNN are certainly hoping so. They just beat out Lionsgate, IFC, HBO and Radius for the distribution rights. Here's some of what the critics at Sundance have been saying. Three weeks after SeaWorld issued an initial public offering on Wall Street, a new movie at the Sundance Film Festival stands a good chance of putting the $2-billion theme park out of business. ... The more we learn about orcas, the more we realize how smart and special they really are. Cowperthwaite interviews a neurologist who points out orcas have a limbic system far more advanced than Homo sapiens, suggesting killer whales have a highly developed emotional consciousness. In fact, the most disturbing image in the movie isn’t the attacks, but the image of a mother orca after being separated from her baby. In the wild, babies never leave their mother’s side. 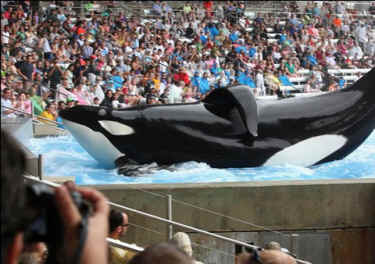 But at SeaWorld, offspring are moved if they get in the way of the show. Blackfish draws much of its disturbing power from a plethora of video documentation showing various attacks. In every case, the aggressive whales initially strike their naive caretakers as well-adjusted beings. ... [It] forms an effective case against the entire institution of SeaWorld by placing it in a terrifying historical context. As a work of journalism, Blackfish delivers a pretty damning condemnation: No clandestine maneuver on SeaWorld's part could possibly discount the destructive impact of orca captivity proven herein. And the Hollywood Reporter calls the movie "a damning indictment of the SeaWorld theme park franchise, whose management declined repeated requests to be interviewed." ... It’s startling to learn that despite Tilikum’s unstable history, the mammal’s sperm has been so extensively used for artificial insemination that its genes are now present in more than half the whales in SeaWorld parks. As scientists state, breeding from such a clearly damaged animal would be unthinkable in virtually any other case. ... Blackfish will likely draw comparison to the 2009 doc The Cove, about mass dolphin capture and slaughter in Taiji, Japan. As searing as that film was, this one has equal if not greater impact. The sheer size and magnificence of the animal makes its plight in confinement arguably even more tragic, along with the evidence of its ruptured family dynamic.